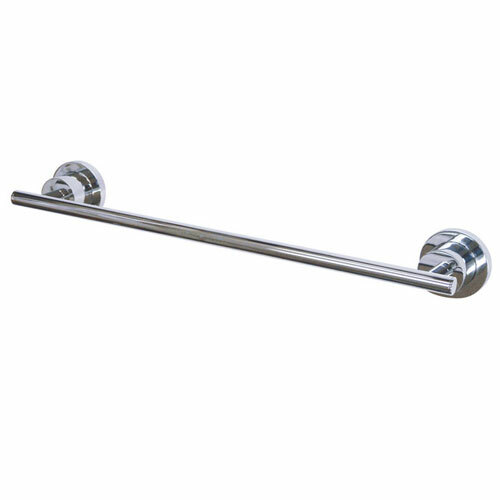 Kingston Brass Concord Bathroom Accessories Chrome 24-inch Towel Bar BA8211C: This 24-inch Towel Bar is built to last. The highest quality standards are used to precision manufacturer a top of the line product. Important features of this BRAND NEW Fixture: Complete Item! Everything necessary for installation is included. Matching Accessories Available - Easy to Install - Installation instructions included - 24-inch Towel Bar - Concord Collection, Fabricated from solid brass material for durability and reliability, Premium color finish resist tarnishing and corrosion, Easy to install, Matching collection available, 4-inch extended from the wall, 4-inch extended from the wall, 19-5/8-inch overall length, One Year Limited Warranty to the original consumer to be free from defects in material and finish. - High Quality Brass Construction - Timeless Concord Design - Solid Die Cast Construction & Legendary Reliability - Chrome premier finish designed to resist fading and tarnishing. This fixture is manufactured by Kingston Brass and is part of their Concord collection. Concord Collection, Fabricated from solid brass material for durability and reliability, Premium color finish resist tarnishing and corrosion, Easy to install, Matching collection available, 4" extended from the wall, 4" extended from the wall, 19-5/8" overall length, One Year Limited Warranty to the original consumer to be free from defects in material and finish.